Bridge crack repair in the Philippines. Make Roadware 10 Minute Concrete Mender part of your bridge preventative maintenance program. Repair cracks as they develop when they are small. Don’t let small cracks turn into big problems. Roadware 10 Minute Concrete Mender™ is extremely tough and will withstand even the harshest punishment. 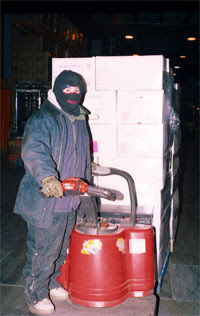 Use all year long… may be applied at temperatures as low as -20° F with excellent results. The Gilbert Bridge in the Philippines. Crack repairs on the Gilbert bridge in the Philippines with Roadware 10 Minute Concrete Mender. Roadware 10 Minute Concrete Mender is great repairing surface cracks in a bridge deck. The flow-and-go application along with the 10 minute cure time allow repair crews to get on and off the bridge quickly. Traffic can be returned to the bridge in just 10 minutes after application. 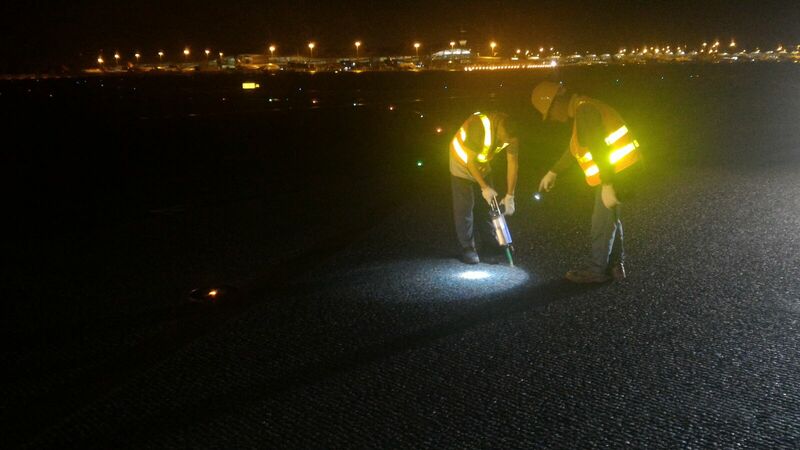 In the Philippines, crews often work at night when traffic is low and working conditions are cooler. Crews work in teams. One person shoots the Concrete Mender from 600ml cartridges, one person applies filler sand, and one person trowels the repair smooth. Sunset photo of the Bantum Bridge in the Philippines. Workers repairing cracks in the Bantum Bridge in the Philippines using Roadware 10 Minute Concrete Mender. What are the reasons DOT’s Roadware? 1) “Safety for the driving public.” Roadware repairs are ready for traffic in 10 minutes. Lane closure time is dramatically reduced. 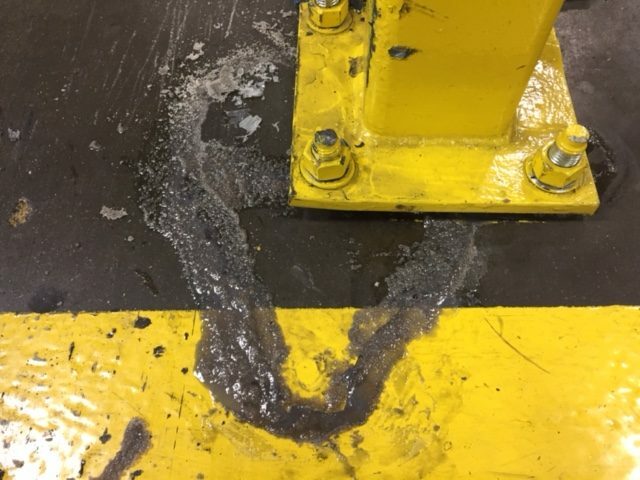 2) “Safety for my crew.” The interstate is a dangerous work environment, the quicker repairs are made, the less exposure to the hazards of working on a heavily traveled interstate. 3) “Saves a lot of money.” Quick cure times, easy mixing, straight forward application, and good long term performance makes Roadware 10 Minute Concrete Mender a good value. After a few days of training, the crew was able to repair a bridge in half a day. One district in Wisconsin saved about $1500 per bridge over conventional repair methods. No overnight lane closures are needed and crews are more productive with less equipment requirements. 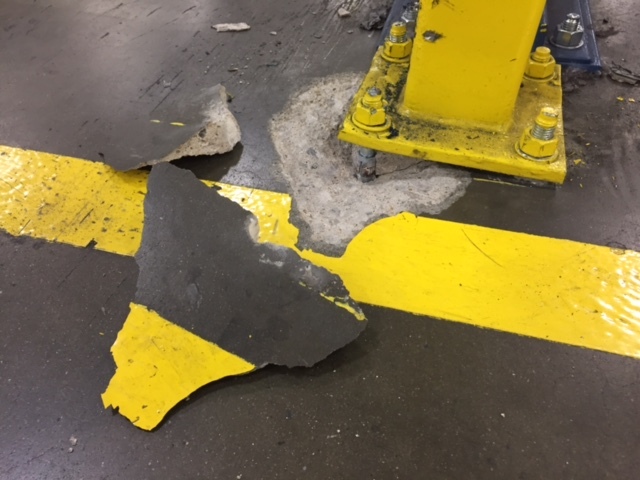 Bill Neal of Neals Design recently repaired spalled and cracked concrete on the fly at a service station in Washington. 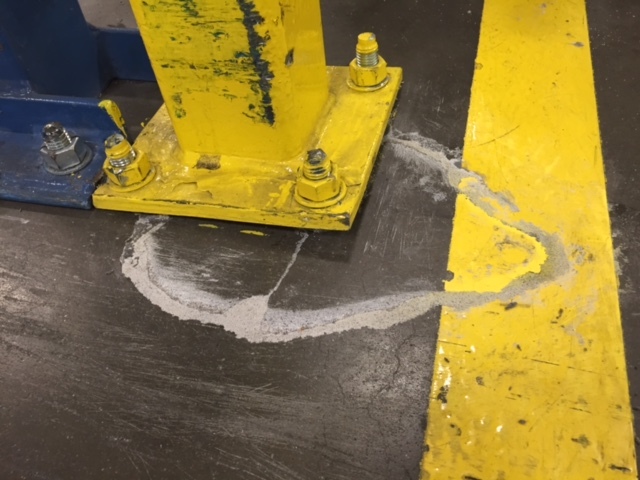 A customer had broken an ankle stepping out of a truck into the badly spalled concrete. Bill was able to make the repair in minutes, eliminating the safety hazard without major disruption to the service station. Roadware 10 Minute Concrete Mender is your go to product for making long-lasting repairs with minimal downtime. 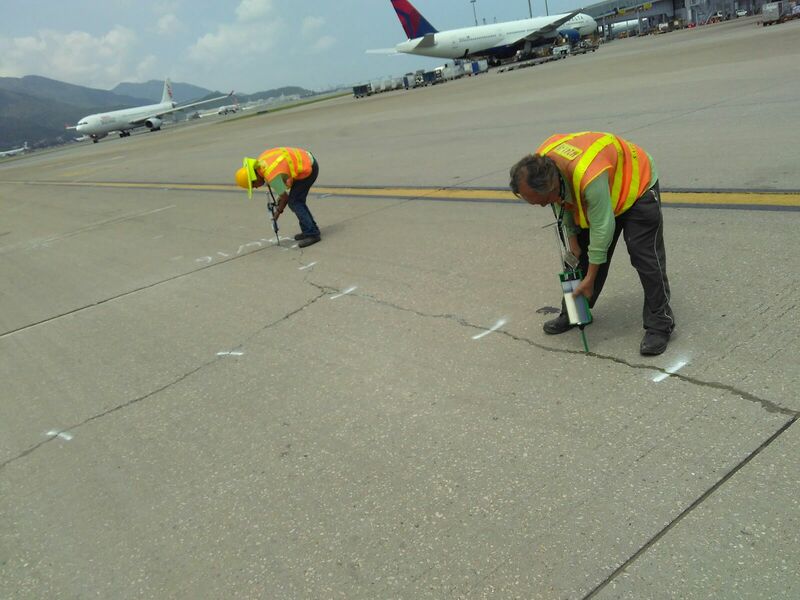 At 70 degrees F or 21C, A Concrete Mender repair can be ready for heavy truck traffic in about 10 minutes. Finished Concrete Mender repairs ready for traffic. Pool spalls are cleaned and prepared for repair with Roadware 10 Minute Concrete Mender. What do you do when your pool has cracks and spalls and it has to be open is three days? Back in 2001, the City of South Saint Paul, Minnesota had a problem with their new splash pool. 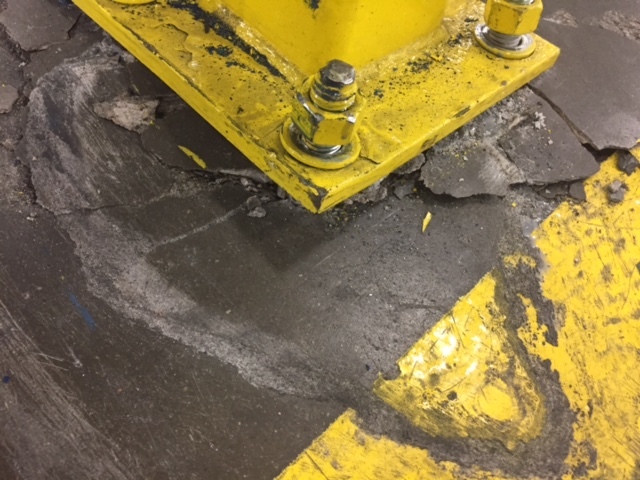 Just before opening the pool for its second season, cracks and spalls were discovered in the concrete pool bottom and along corner where the floor meets the wall. The damaged was probably caused by the first Minnesota winter for this neighborhood splash pool facility. The repairs needed to be done fast. The pool was scheduled to be open in just three days. Any delay would be a disappointment for local families and political problem for the City who spent a lot of money to build this water recreation facility. The call went out to see if anyone could come up with a solution. Roadware Incorporated, also located in the City of South Saint Paul, received a call from the Parks and Recreation Maintenance Department to see if we had any ideas. It turns out, Roadware 10 Minute Concrete Mender™ is a great product for repairing concrete pools. The cross-linked polyurethanes in Concrete Mender and very resistant to water, chlorine and other pool chemicals. Roadware personnel were at the pool within a few hours and repairs were made using a mixture of Roadware 10 Minute Concrete Mender and manufactured sand. Mixing 10 Minute Concrete Mender with sand in a bucket prior to repairing a spall in the concrete pool floor. Roadware 10 Minute Concrete Mender is flooded into the spalled ares and seeded with manufactured sand. Roadware 10 Minute Concrete Mender and sand are applied to spalls in the pool floor. The Concrete Mender and sand bland can be troweled in place and will cure in about 10 minutes. Roadware 10 Minute Concrete Mender mixed with sand is troweled into place. Vertical surfaces can be repaired by mixing Concrete Mender with fine manufactured sand and troweled in place. Pool repairs at the pool edge are made with Concrete Mender mixed with sand and troweled in place. 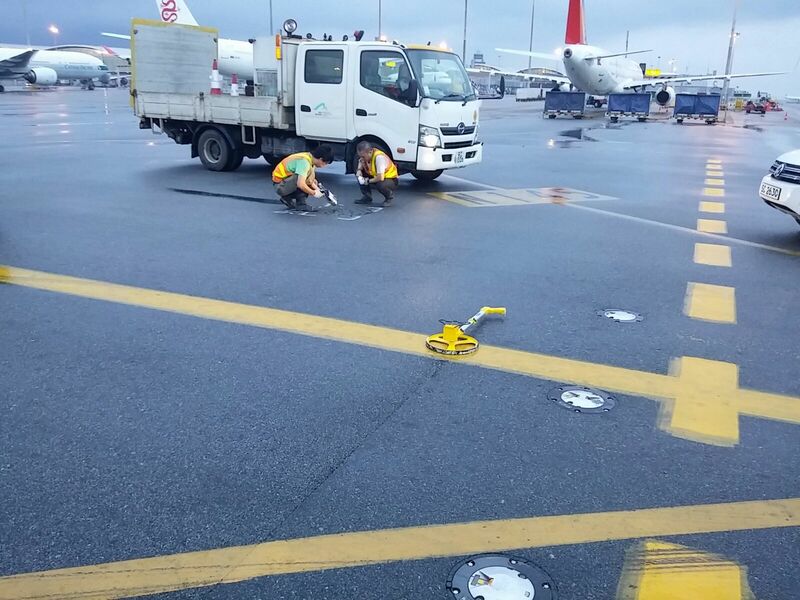 Repairs can be painted using standard methods in 10 minutes after application at 70 degrees F (23C). Finished repairs were ready for paint in minutes. All the repairs took just a few hours to complete and the pool was ready for a fresh coat of paint in minutes. The pool was painted and filled with water the next day. The Concrete Mender repairs have largely been forgotten, but continue to perform to this day. The South Saint Paul Splash Pool in 2017. Concrete Mender repairs in the pool still look good 16 years later. Roadware 10 Minute Concrete Mender™ 600ml cartridge item 80300.